MILWAUKEE, Wis. (Legal Newsline) - A settlement has been reached in a class action lawsuit alleging Subway’s sandwiches were falsely advertised as being six and 12 inches long. Judge Lynn Adelman for the U.S. District Court for the Eastern District of Wisconsin signed an 11-page order preliminarily approving the settlement agreement and certifying the settlement class earlier this month. 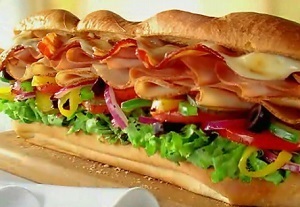 In their complaint, lead plaintiffs Nguyen Buren, John Farley, Vincent Gotter, Barry Gross, Jason Leslie, Ayanna Nobles, Charles Noah Pendrak, Andrew Roseman, Richard Springer and Zana Zeqiri alleged that foot-long sandwiches sold at Subway restaurants were marketed as being 12 inches in length, when, in fact, they were not. The plaintiffs also alleged that the chain’s six-inch sandwiches were not the advertised length. According to their complaint, Subway’s alleged business practices violated state consumer protection statutes. The class action stemmed from a social media post in 2012, pointing out how the chain’s foot-long sandwich came up short. The class includes anyone who has purchased a six-inch or foot-long sandwich from Subway between Jan. 1, 2003 and Oct. 2. Doctor’s Associates Inc., or DAI, the franchisor of Subway Sandwich Shops, noted in a statement that the court, in its Oct. 2 order, did not make any findings that any of its marketing or practices were improper or unlawful. “In settlement, DAI has agreed to certain practice changes for the benefit of all Subway customers and to pay attorney’s fees and class representative service awards,” the company stated. The court appointed the following firms as class counsel: Zimmerman Law Offices PC; DeNittis Osefchen PC; Law Offices of Todd M. Friedman; Edelman Combs Latturner & Goodwin LLC; Agruss Law Firm LLC; Ademi & O’Reilly LLP; Evans Law Firm PA; Hirsch Law Firm PA; Marks & Klein LLP. Zimmerman and DeNittis were appointed lead class counsel, according to Adelman’s order. According to the settlement website, class counsel will submit an application to the court by Dec. 7 to award payments in an amount not to exceed $1,000 for each of the lead plaintiffs. DAI has agreed not to oppose any request up to this amount so long as the attorneys’ fees, costs, expenses and class representative service award sought do not total more than $525,000. No money is available to class members under the terms of the settlement. However, Subway agreed to require that franchisees use a tool for measuring bread in each restaurant to help ensure that the bread sold to customers is either six or 12 inches long. It also agreed to require a regular compliance inspection of each restaurant, generally to be conducted monthly. “The sampling will include measuring at least 10 baked breads in total, and breads using both the Italian and Nine-Grain Wheat loaves will be included in the sample,” according to the settlement website. The court must approve the settlement before it becomes final. Currently, a settlement fairness hearing has been set for Jan. 15. Dec. 16 is the deadline for filing objections to the deal. “The settlement is not an admission of any wrongdoing by the defendant, and the court did not decide in favor of plaintiffs or defendant. Instead, both sides mutually agreed to settle the claims,” according to the settlement website. Want to get notified whenever we write about Zimmerman Law Offices, P. C. ? Sign-up Next time we write about Zimmerman Law Offices, P. C., we'll email you a link to the story. You may edit your settings or unsubscribe at any time.